The Long Legacy Of Latin Music Influencing Hip-Hop Stretch Armstrong and Bobbito Garcia of NPR's 'What's Good' podcast break down how hip-hop has borrowed from Latin music many times over the years. 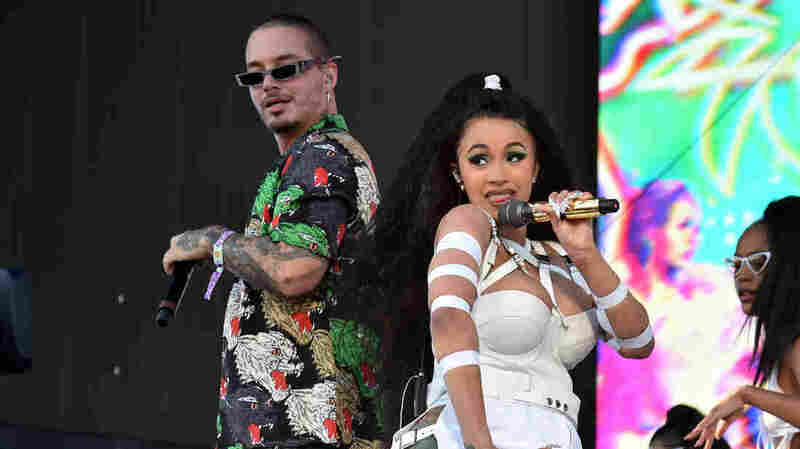 Cardi B and J Balvin perform "I Like It" during the 2018 Coachella Valley Music And Arts Festival in Indio, Calif. in April 2018. "That was a great moment in New York, particularly in Nuyorican history, whereby rhythm and blues of the African American community was bridged with ... Latin roots," DJ Bobbito Garcia says when recalling the birth of the short-lived boogaloo movement that would eventually lend itself to Cardi's smash hit more than 50 years later. DJ Stretch Armstrong remembers when he started to incorporate "I Like It Like That" into his DJ sets, which he notes, at the time, were "99 percent not Latin music," how instantly magnetic the song became. Armstrong and Garcia, who host NPR's What's Good podcast, say there have been a number of hip-hop artists who have sourced Latin music over the years. Armstrong remembers Boogie Down Productions' 1988 remix of "I'm Still No. 1," which samples the horns from the Tito Puente record "Jumpin' with Symphony Sid," as an early example of Latin music sampled in rap. Garcia credits BDP's Nuyorican producer and engineer Ivan 'Doc' Rodriguez with fitting the Puente sample in with KRS-One's lyrics. And as hip-hop music and culture evolved, '90s rap innovators with Hispanic heritage like Cypress Hill and Big Pun incorporated their culture into their raps. "The beautiful thing about hip-hop has always been how it references old music," Armstrong says. "And if you're curious, you discover this world of music that you ordinarily, perhaps not have gotten into." Stretch and Bob say it's certainly not just a trend for Latin influence to be part of hip-hop. "Cardi B is just part of a long legacy of Latinos drawing from their own experiences and infusing them into current rap," Garcia says.